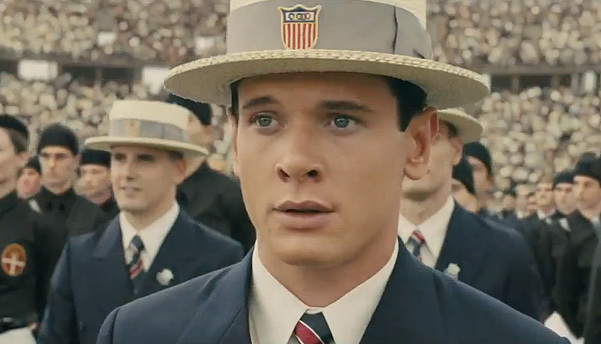 Unbroken is a film that should break you; the true story of Louis Zamperini (Jack O’Connell) and what he went through should leave you shell shocked. This movie doesn’t have that effect, and that is where it falls short. The film is cast brilliantly, the cinematography is gorgeous, the screenplay (Coen Brothers) is well done, and I can’t even complain that much about Angelina Jolie’s directing. But when you put it all together, something doesn’t sit right with me. 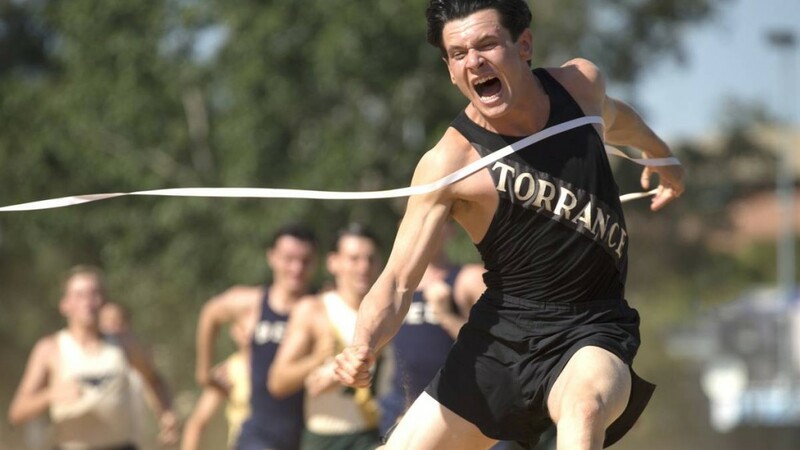 The story of Louis Zamperini’s life is an incredible, almost unbelievable, tale. Born to immigrant parents, Zamperini didn’t fit in with the other kids and frequently got into trouble. He picked up track at his older brother’s urging and surprisingly, was quite good. This skill eventually landed Louis at the 1932 Olympics as a track and field new comer. Shortly after, he enlisted in the Air Force during World War II. An Olympic athlete turned bombardier you say? That’s an impressive life… but that’s where the movie begins. The film opened with a scene of Zamperini and his crew flying above the Japanese islands. The calm feeling of cruising above the clouds was rocked by incoming enemy fire. It was a very tense and nerve racking opening sequence. It had me on the edge of my seat, ready to see what happened next… but the film quickly switched gears to a flashback from childhood. It did this quite a bit at the beginning, which ultimately got a bit tiresome. I don’t know that it was completely necessary to have as much time spent on the flashbacks. 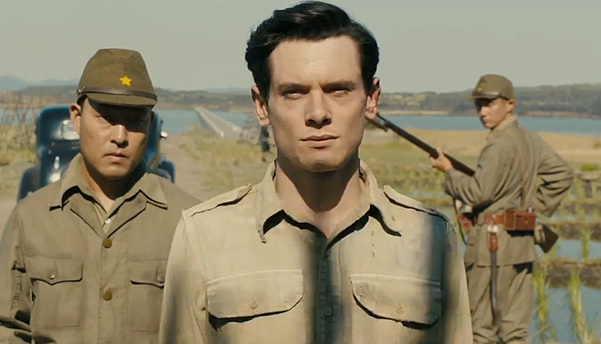 Once we were caught up and back in real time, we ultimately get to the heart of the movie, where Zamperini’s plane goes down and he’s forced to deal with the grim reality of what lies ahead. Zamperini ends up adrift in the ocean with two crewmates. He was not only the leader, the rational one, the resourceful one, but he was their hope. At every point in this film when it’s rock bottom, it gets worse. Eventually their raft makes it to land where they are captured by the Japanese. Zamperini was put in a prisoner of war camp. There is at least another hour of the movie where he was beaten, tortured and abused by a Japanese prison guard (Takamasa Ishihara) nicknamed “The Bird.” These scenes are incredibly hard to watch, and in my opinion, overdone. The message of this film is not about brutality or cruelty, but rather one of resilience, survival and redemption… and my take-away… forgiveness. The movie does have a happy ending and the waterworks really only came at the end when they showed the real pictures and updates from the real Louis Zamperini’s life. My problem with this film may be a personal one. This film should have destroyed me… this should have given me nightmares, but it didn’t. I think it was overdramatized to the point where parts of it were so unbelievable that it took away from its credibility, and that’s a shame. This entry was posted on Monday, December 22nd, 2014 at 8:11 pm	and is filed under Film, News. You can follow any responses to this entry through the RSS 2.0 feed. You can skip to the end and leave a response. Pinging is currently not allowed. « Film Review: ‘Into the Woods’!